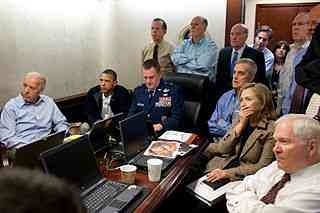 In the Situation Room watching the raid on Osama bin Laden’s compound. According to official US statements Osama bin Laden is dead, but the fight against his legacy is not over. He lives on in the militant jihadist network he envisioned and then seeded. US counterinsurgency missions continue in the Middle East and Africa against ‘high value individuals’ associated with Al Qaeda’s network. Bodies pile up in a relentless cycle of tracking targeting and killing, but no matter how many ‘kills’ officers in US Special Operations Forces (SOF) collect, they continue to miss their target. They are unable to hit the object of fundamentalist Islamic political theology, that magical thing which makes bin Laden so attractive to his followers and repulsive to his enemies. The existence of this other body, bin Laden’s ‘body politic’, is larger than any individual life and transcends death. The US should be careful that it does not sacrifice its own body politic to endless targeted killings that always miss their mark. Long before President Obama gave the order to take bin Laden’s life, bin Laden was already little more than an idea for all but his most trusted and intimate supporters. Having gone underground to evade execution, his public persona no longer had any physical presence. There are no pictures of him “looking at things” in the manner of North Korean leader Kim Jong Un. He rarely released video footage of himself with messages for his followers or enemies. The weight of his presence in the symbolic order–the everyday practices and beliefs that constitute lived reality and guide our actions–had already become so disassociated from his physical being, that his death felt overdue. Bin Laden’s physical death had little meaning because his natural body is just as absent in death as it was in life. His corpse was never made available to the public for viewing and pictures of it remain closely guarded. President Obama explained his rationale for this policy in an interview on 60 minutes, saying that “We don’t trot out this stuff as trophies. We don’t need to spike the football…That’s not who we are.” The corpse was reportedly buried at sea, a decision which deprived bin Laden’s followers of any burial rites or destination to visit in reverence and respect, but also left the American public with out the satisfaction of a carnal victory. Not surprisingly, a desire for bin Laden’s physical body persists, circulating in the form of garden variety conspiracy theories and, more importantly, a law suit demanding the release of Top Secret photos taken by US officials for internal circulation. Recently, a federal appeals court ruled that the Central Intelligence Agency was under no legal obligation to release photos of Osama bin Laden’s body. The determination of the three-judge panel from the U.S. Court of Appeals for the D.C. Circuit was unanimous. They agreed that releasing pictures taken while US military personnel buried the Al Qaeda leader’s corpse could “could cause exceptionally grave harm.” The photos will remain classified as Top Secret, and therefore exempt from the Freedom of Information Act. 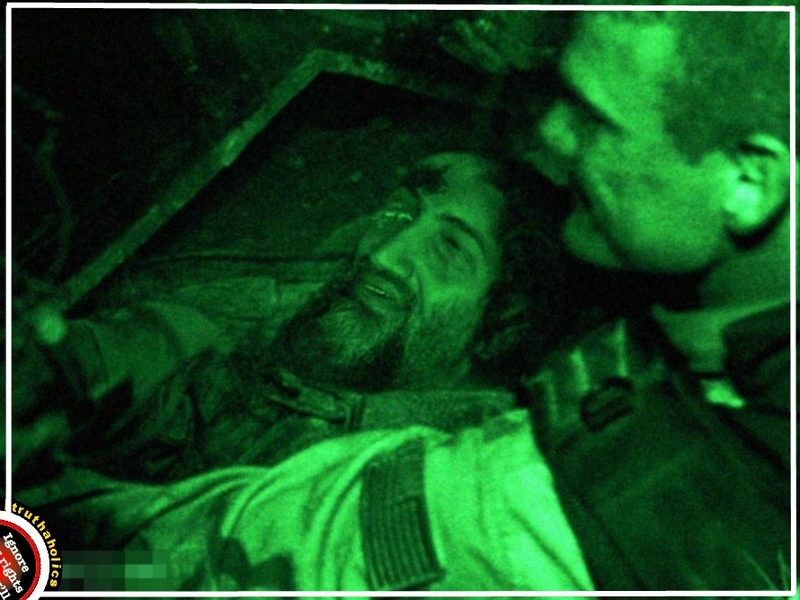 For now, the only visual confirmation of Osama Bin Laden’s death available to the public is the iconic photo of President Obama and his top aids in the White House Situation Room on the afternoon of May 1, 2011, watching intently as Joint Special Operations Forces carried out a raid on Osama bin Laden’s compound. The degree of remove between the event and direct access to any sensory knowledge of that event is remarkable. In so far as the picture communicates anything of substance, it depicts the gravity with which the principal US decision makers experienced the event–the intensity of Obama’s gaze and the tension evident in Secretary of State Hillary Clinton’s gesture, her hand raised to cover her mouth. What we do not see is any still image from the live stream on which their gaze is fixed. Our view of the event is mediated first by the feed sent from thousands of miles away to the Sit Room and then by the camera lens of Pete Souza, the White House photographer. The image that we see is at least two degrees of separation from the people who are carrying out the mission. In an address at the US Naval Academy, Clinton revealed that the exact nature of what the officials in the Situation Room were watching was not clear, even to them. She reported that they “could see or hear nothing when [the SEALs] went into the house. There was no communication or feedback coming so it was during that time period everyone was particularly focused on just trying to keep calm and keep prepared as to what would happen.” Their experience of the event is also mediated, transmitted over thousands of miles, and obscured by technological limitations on real time communication. Katherine Bigelow’s film, Zero Dark Thirty, has sparked an intense debate about its portrayal of torture, but its brilliance lies in the much more prosaic observation that it gives us our first and only glimpse of bin Laden’s “body.” In its climatic portrayal of the raid on the bin Laden compound, we, as viewers, get to watch the live stream as if we too were in the Sit Room with Secretary Clinton and President Obama, watching not what they actually saw, but what we desire them to have seen. There is a sublime quality to iconic figures like bin Laden that makes even the most mundane aspects of their everyday existence an object of fascination: What does he eat? Where does he live? Is he like us? What makes him different? This same type of curiosity is what sells gossip rags with paparazzi photos that reveal celebrities live, “Just like us!” They shop, take their kids to the park, work out, and have bad hair days. And yet, the more ordinary details that these magazines reveal, the more special the ordinary aspects celebrities appear. Our collective fascination attaches itself to them. The more is revealed, the more we desire, and the deeper the mystery becomes. They are just like us, and yet, they are different because the mundane details of their lives carry a fascination and appeal that are banal when observed in others. The problem for the United States is that it turned out that when the public finally had access to information about bin Laden’s material existence, he was, in fact, living ‘just like us’. Contrary to the musings of President George W. Bush, he was not hiding in a cave. Unlike Saddam Hussein, he was not retrieved from a hole, abandoned by his people, and begging for his life in a shameful moment of defeat. The announcement of bin Laden’s death revealed that he had been living in a compound in a wealthy suburb of Abbottabad, Pakistan surrounded by his family and supported by his network. First, while civilian casualties are rarely acknowledged by the US government, there is significant evidence that US drone strikes have injured and killed civilians. Second, US drone strike policies cause considerable and under-accounted-for harm to the daily lives of ordinary civilians, beyond death and physical injury. Third, publicly available evidence that the strikes have made the US safer overall is ambiguous at best. Fourth, current US targeted killings and drone strike practices undermine respect for the rule of law and international legal protections and may set dangerous precedents. The US should ensure that the actions it takes in the name of national security meet standards of democratic accountability and transparency and that they comply with international humanitarian and human rights law–not only because it is the right thing to do, but also because staying true to democratic principles is the best strategy. If the US wants to hit its target, killing individual terrorists should remain secondary to maintaining the health of its own body politic.